More than 300 artists from across Australia will showcase work in TARNANTHI (pronounced TAR-nan-dee), the inaugural Festival of Contemporary Aboriginal and Torres Strait Islander Art, right across Adelaide from 8 -18 October - with exhibitions continuing at the SA Art Gallery until 17 January 2016. TARNANTHI is presented in partnership with BHP Billiton and supported by the Government of South Australia. TARNANTHI presents a series of twenty-two partner exhibitions and performances in partnership with key cultural organisations including an Art Fair on the opening weekend at Tandanya National Aboriginal Cultural institute. TARNANTHI Artistic Director, Nici Cumpston says, “TARNANTHI is about bringing people together to celebrate the vibrancy and diversity of work being created by contemporary Aboriginal and Torres Strait Islander artists from across the country”. A major highlight of the Festival’s opening weekend will be the TARNANTHI Art Fair at Tandanya National Aboriginal Cultural Institute. Opening at 5pm on Friday 9 October, the Art Fair will provide an opportunity to buy works of art directly from more than 40 art centres from across the country as well as from independent South Australian artists. 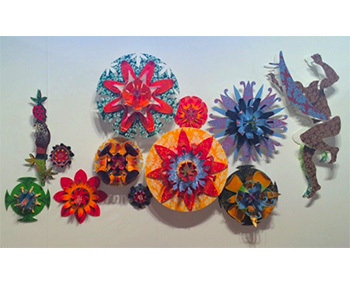 Priced from $50 to $10,000 the Art Fair will appeal to those buying their first work of art as well as dedicated collectors. 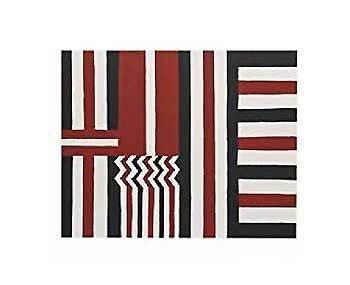 Welcoming audiences to the multiple exhibitions at the SA Art Gallery is Bush Footy, a series of carvings and paintings celebrating AFL by husband and wife Dinny Kunoth Kemarre and Josie Kunoth Petyarre, who've been working on immortalising the code since 2006. From Queensland, urban star Tony Albert meets Alair, scion of the Wik cultural dynasty, the Pembegans in a challenging collaboration; from WA, 22 Spinifex artists are showing off their latest paintings; local star Yvonne Koolmatrie, Murray Riverland weaver extraordinaire gets a comprehensive survey of her work; from Alice Springs the Namatjira Family transfer from canvas to a range of clothing; from Arnhemland, the Yolngu expressionist, Nyapanyapa Yunupingu shows 80 of her works; from the Torres Strait, the cross-cultural Brian Robinson produces a major work, 'Custodian of the Blooms'; from the Tiwi Islands, Cornelia Tipuamantumeri shows works featuring ochres applied with a pwoja/comb; from the APY Lands in the north of SA, the Desert Salon will show a range of the most dynamic Aboriginal artists now at work; and from Woomera via Melbourne, Yhonnie Scarce reminds us of the horrors of Maralinga with 2000 hand-blown glass vessels that are both bush yams and mushroom clouds. JamFactory and the South Australian Museum (SAM) will present 'Shimmer', featuring new works by eight artists Sebastian Arrow, Tamara Baillie, Maree Clarke, Janet Fieldhouse, Dale Harding, Grace Lillian Lee and Vicki West responding to the SAM's historical collections and exploring the concept of adornment. 'Nganmarra: The Container of Life', at the Santos Museum of Economic Botany in Adelaide Botanic Garden features woven conical mats made by senior Yolngu artists from Bula’Bula Arts at Ramingining in North East Arnhem Land: Frances Djulibing Daingangan, Mary Dhapalany, Robyn Djunginy, Julie Djulibing Malibirr and Evonne Munuyngu. 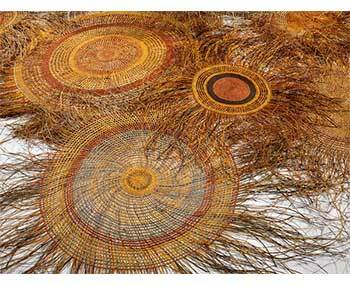 Using a combination of traditional methods and new techniques, the artists express themselves and their culture through woven fibre and produce some of the most brilliant sun-mats.